This page is dedicated to everything Tommy. Tommy has his own incredible story and is a miracle from God. I talked about Tommy's birth briefly in "Our Story" but I will go into more detail now about his struggles through out his early childhood. Tommy was born 14 weeks premature weighing in at a whopping 1lb 12oz and 13.5 inches long. He lost weight and at one time weighed as little as 1lb 7oz. Can you picture taking a pound and a half of hamburger and forming it into the shape of a baby? Tiny little guy. He had respiratory problems from the beginning and suffered a brain hemorrhage shortly after birth. He was in the hospital for 137 days. After many ups and downs on December 4th, he developed a severe lung and blood infection and suffered cardiac arrest. When we arrived at the hospital that evening, we had no idea that he had gotten so bad and were wisked into a private room. We thought he had died. We were told that he was very ill and if he continued to deteriorate we should consider stopping his life support. Can you imagine hearing those words? I still cry sometimes when I think about it. Those 3 weeks that he lay near death in Good Sam were 3 of the worst weeks in my life. We had tried so hard to have a baby and here we were waiting for him to die. They gave him less than a 5% chance of surviving the infection. He had surgery to put in a central line near his heart to give him his antibiotics and so they wouldn't have to keep sticking him. God is amazing. On Christmas Eve, Tommy started improving and by New Year's Eve he was drinking from a bottle and only on oxygen. But his battle was far from over. He developed strider(heavy wheezing) so in mid January he was transported to Children's for a bronchoscopy. They found his airway was the size of a pencil lead. He returned to Good Sam and was put on steroids to try to open the airway but by February 1 he was back on a ventilator and on his way to Children's for a possible tracheostomy. Another bronchoscopy showed no improvement, so he was given more steroids and other drugs to try to reduced the swelling. 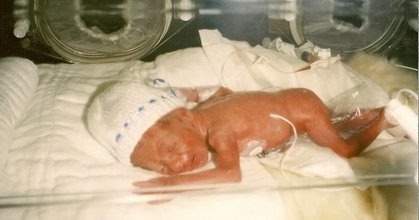 Finally, his air way opened up and on February 28, 1995 we took him home. He was on oxygen until July. He had an enormous hernia and had surgery for that in May. Before Tommy was eight he had 8 surgeries. He had pneumonia twice and RSV every fall until he was 6. He had years of physical, occupational and speech therapy. Finally when he was 9, everything was as normal as it could be. He suffers from sensory integration dysfunction, which prevents him from feeling pain, hot and cold like normal people. He can be very sensitive to certain sounds. When he was a baby, blow dryers and smoke alarms totally freaked him out. He had trouble keeping up in school but now is a normal teenager. All he is dealing with now is scoliosis and hopefully he will out grow that. The Doctors said he would always be small and grow no taller than 5'9". What do they know? He is already 5'10 and still growing. I have no idea what God has in store for this special child but it must be something wonderful for him to save his life. I enjoy watching him play baseball. If only he would clean up his language. Now he loves all things baseball. Ask him anything about baseball and he can tell you the answer. Here is the Mason Freshman White team he is lucky #7. Go Mason Cobras, Tommy's summer team. Tommy graduated from Mason High School in 2013. He attended Brown Mackie College in Salina, KS during the fall of 2013 on a baseball scholarship. Tommy is now attending Wilmington College in Wilmington, OH. Go Quakers!